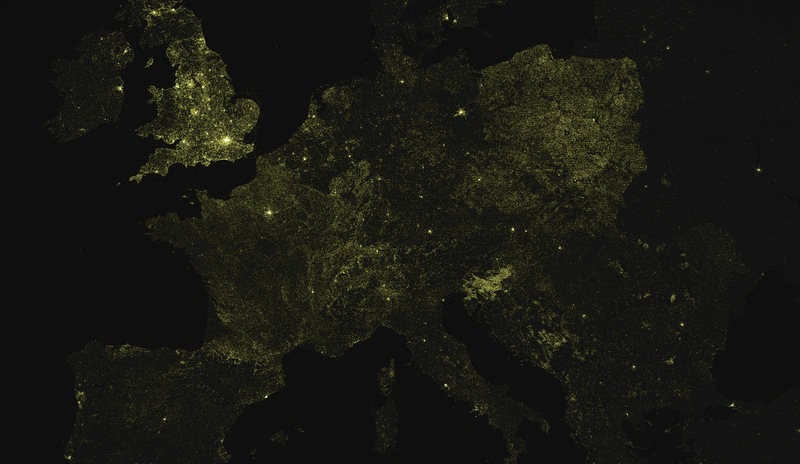 We know by now that all online platforms have distinct, and highly uneven, geographies. Wikipedia is no exception: and we therefore decided to make a tool that would allow people to explore what, and where, the world’s most popular encyclopedia represents. The tool, made by the excellent team at TraceMedia, as well as the Oxford Internet Institute's Bernie Hogan, and myself (Mark Graham) can be accessed at the following link. The tool is built as part of our project to study participation and representation on Wikipedia in the Middle East and North Africa. It currently allows you to explore the geography of all geotagged Wikipedia articles in Arabic, Egyptian Arabic, English, Farsi, French, Hebrew and Swahili. It also allows mapping of a range of metrics including the word count of an article, date created, number of authors, and number of images. A few screenshots of the tool are below. You can also read more about how it was built, or simply start playing. The tool is still work in progress, and there is a lot to add and fix, but we hope it is useful in the meantime! As a quick follow-up to one of my previous posts showing the geography of edits to Wikipedia, I wanted to share another map depicting the huge inequalities in where contributions to the encyclopedia in the MENA region come from. In particular, this map allows us to get a sense of how many edits (to any Wikipedia language version) come from Israel compared to other countries in the region. In other words, Israelis are far more active in creating/reproducing knowledge in one of the world’s most used websites than their counterparts in the rest of the Middle East and North Africa. 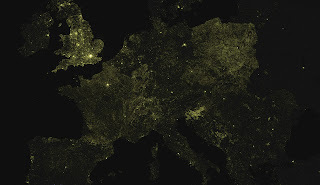 I’ll post some versions on these maps normalised by population/Internet population soon-ish. Few would disagree with the above quote, but a key issue is that the production of knowledge is far from evenly distributed. 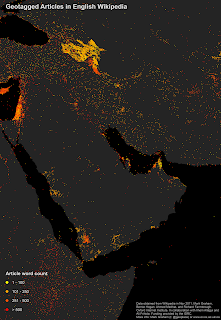 The maps below visualise article length of Wikipedia articles (in English) about the Middle East. The first graphic shows a few unexpected patterns. First, we actually don’t see that many articles created about the region - compared to content created about many other parts of the planet. Also noticeable is the fact that we see a thick layer of information that has been created over most of Azerbaijan. As mentioned in a post that I wrote a few weeks ago, Azerbaijan has the lowest average word count per article out of any country in the world (159 words per article). This is most likely the case because of both the thousands of stubs that have been created in the country (i.e. articles containing little or no content) and the fact that there are only very few articles containing a lot of text in the country. Looking at non-stubs, we see clusters of content in many of the large cities on the Persian Gulf (e.g. Kuwait City, Manama, Doha, Abu Dhabi, and Dubai) and an even bigger cluster of articles over Sana'a in Yemen. A series of relatively long articles about places in Iraq are also noticeable along the Tigris and Euphrates rivers. But maybe the most visible cluster of user-generated information sits over Israel and the Palestinian Territories in the far-western side of the map. There are significantly more high-quality (i.e. long) articles about that area than the rest of the region. The cluster of information over Israel and the Palestinian Territories can be even more clearly seen in the map above. Amazingly, content about Cairo - the Middle East’s largest city - is barely noticeable compared to the glowing dots that represent information that has been created about the land between the Mediterranean and the River Jordan.